The novel, Vrolok, chronicles the journey of a young vampire by the name of Isabella. As a child, Isabella lives in a harsh and cruel world, rejected by her father who cannot see past his wife’s death while giving birth to Isabella. Isabella grows up with a rebellious and independent spirit that leads her to the Castle of Vampire Vlad Dracula. Vlad falls in love with her and turns her into a vampire. For about five centuries, Vlad and Isabella suffer a love-hate relationship, remaining loyal and protecting each other from their own death. 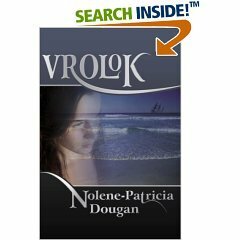 Vrolok is a well-plotted and compelling work of historical fiction. Isabella’s historical journey not only reveals the demons and struggles in her own mind, but also plots the dark history of humanity entwined in such events as torture and murder in the name of religion. The brutal struggle for dominance and power, and the extent one is driven to in pursuit of eternal youth and beauty, clearly resides within the story. As a powerful fictional account, Vrolok unveils a tale of humanity’s ruthless struggle for survival that is dark and cruel, as well as the blood curdling results when both Vampire and Mankind collide. In the eyes of a vampire struggling with her own dismal past, Vrolok tells a story of humanity’s innermost demons and its moral justifications for shaping a world with such brutal and sinister events. Vrolok incorporates the techniques of early Gothic Writers but goes beyond traditional Vampire tales to produce a macabre account of humanity that delves into love, obsession, greed, paranoia, and the blind quest for eternal youth and beauty. I highly recommend this well plotted work of Gothic historical fiction to readers who enjoy spine-chilling suspense wrapped in an outstanding vampire tale. The book Quantum Evolution, How Physics’ Weirdest Theory Explains Life’s Biggest Mystery, considers Quantum Evolution as an important factor influencing biological evolution and the human consciousness. A professor of molecular genetics, author Johnjoe McFadden provides a comprehensive account of the origins of life to the evolution of human consciousness. McFadden details how evolution, with an emphasis on Darwinian evolution, could not have occurred without the influence of quantum mechanics instigating specific molecular and cellular actions. He dismisses naturalism as the single cause of evolution and through a meticulous, well-researched account, details how cells contain order. Dr. McFadden explains that Neo-Darwinism only illustrates evolution of species; it does not explain the origin of the first self-replicating subatomic particle. Neo-Darwinism only tackles evolution from life originating at the first single-cell, not the origin of the first rudimentary form of life. Using Heisenberg's Uncertainty Principle as a source, McFadden articulates that a living cell measures its own internal state. According to McFadden, life is a cellular system engaging in internal quantum measurement for the purpose of replication. With comical anecdotes, interesting insights into historical scientific scholars, as well as current scientists, Dr. McFadden explains the origins of life, its limitations, and how life has evolved to what we see around us. With easy to understand illustrations, and often taking complicated concepts and applying them to every day situations, the book details how particle manipulation in the quantum world could have boosted evolution, and explain the complexities of the mind, consciousness, and free will. As discussed in the book, the mind and consciousness is a very complicated subject. It would be interesting to see how quantum evolution affects our way of thinking. For example, how does quantum evolution fit in with innate behavior, learned behavior, how we distinguish between right and wrong, moral and immoral? That is, how does quantum evolution tie in with the study of psychology? As the author points out, the theory did not originate with him. He acknowledges and explains how others within the scientific field arrived at similar conclusions concerning the function of the subatomic world and its role shaping the universe we see today. Although a few concepts and ideas put forth may be complicated to those with little or no scientific background, the writing and science is clear and logical with many compelling points discussed. I highly recommend this book to high school students and college students with a passion for the sciences and a desire to understand how we got here and the role Quantum Evolution played.